Texas and 9 other states have given Trump until September 5th to repeal DACA, but we refuse to go back in the shadows. Our youth movement is mobilizing again and we’re done with politicians who fail our community on Capitol Hill. Instead, we're taking the fight to Texas and planning the first immigrant-led disruptive action under Trump. Texas's SB4 is the latest version of racist anti-immigration laws aimed at separating our families. We're fighting back with power as consumers and workers by boycotting businesses that support SB4. We're also taking it to the streets--using actions to highlight this injustice. We won't cooperate until we get the respect we deserve. Corporations want immigrant money but not immigrants. There's no better example of this than Walmart. They exist in every immigrant community and the profit they make from our people funds detention centers and our own deportations. Ya basta! 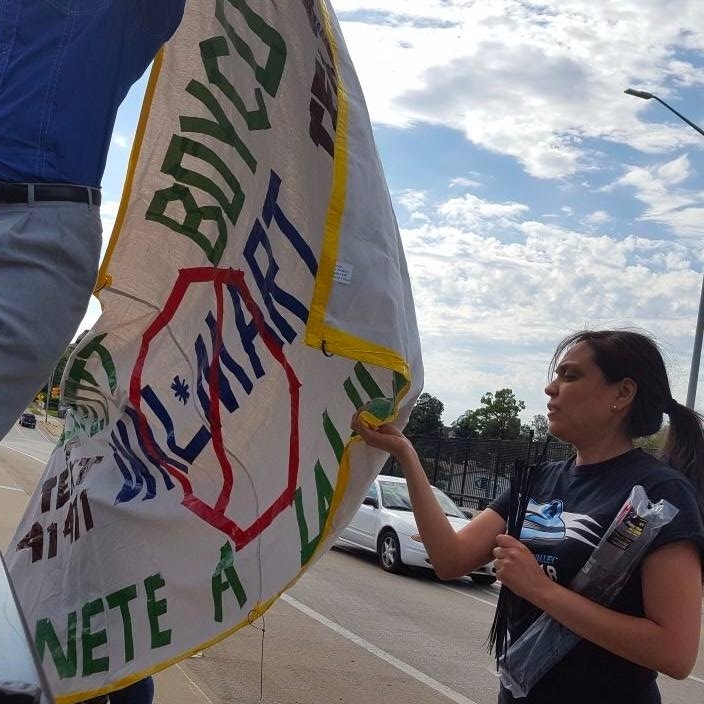 To show our power as consumers, we're stopping business as usual and boycotting Walmart. On May 1, 2017 the immigrant community went on strike to show that this country depends on us! Across the country, Cosecha organizers led and participated in local marches and actions to amplify our message. Supported by over 15 partner organizations, including SEIU West, the Food Chain Workers Alliance, Our Revolution, and Unite Here, our people took the streets in 50 cities and 25 states in our largest nationally coordinated campaign yet. DACA recipients Jose Luis Santiago and Catalina Santiago–who also happen to be brother and sister–were both arrested Wednesday outside of the Texas Capitol in Austin. The goal of the action was to demand “permanent protection, dignity, and respect” for all undocumented immigrants, not just the ones eligible for DACA. In the United States, protesters vowed to participate in civil disruptions throughout the day to draw attention to the importance of immigrants in American communities. "On this day, we will not go to work. We will not go to school. We will not buy anything," said Francisca Santiago, a farmworker from Homestead, Florida. Thousands of Latino immigrants, activists, workers and allies took to the streets on Monday to join in on the national Day Without Immigrants strike. People in more than 40 cities across the country marched and protested. In Grand Rapids, MI, a group of immigrants asked for acceptance, celebrated their heritage and pledged to fight for the rights they say are being denied and disrespected. Hundreds took part in the second "Day Without Immigrants" march on Monday, May 1. Since election night 2016, people all over the country have woken up with the conviction that they must do something to fight inequality, but many are wondering what it is they can do. Here, a conversation with Gloribell Mota, an organizer with Neighbors United for a Better East Boston who is serving as the Boston coordinator for Movimiento Cosecha's May Day event. Cosecha is planning strikes and marches in over 40 cities across the country, along with mass student walkouts and escalated actions. Leaders of the Cosecha Movement are planning farmworker strikes and boycotts in rural communities, such as Homestead, Florida. Workers will also be striking in cities where Trump won with decisive margins, including Grand Rapids, Tulsa, Wichita, Memphis and many others. A group of 20 activists and faith leaders were arrested in front of Boston's South Bay Detention Facility on Monday, according to protest organizers. The 20 arrestees were part of a larger group of activists who staged a sit-in to protest the recent detention of an undocumented immigrant rights activist from Vermont. "What we're hoping to accomplish is to make it clear to the community that we're going to be protecting every organizer — even if they're undocumented," said Maria Fernanda, an undocumented volunteer organizer and with the group the immigrant workers' rights group Movimiento Cosecha, who came to America as a child. Three immigrant rights activists were arrested in Grand Rapids, Michigan, today (April 20) after they blocked—and stopped—traffic during a direct action. Activists began by marching to the city's Immigration and Customs Enforcement (ICE) building with song and drum-banging. They held a banner that read, “We stop disrupting you when you stop disrupting our families,” and varying signs calling for an end to deportations. The leaders of four national unions - part of a new Labor for Our Revolution network - are calling for broad labor support for "A Day Without Immigrants." The union leaders are urging their organizations' local leaders and members to participate in the expected May 1 actions by millions of immigrants who will be striking and marching in cities and towns all across the country. The four unions’ combined memberships represent almost one million workers. Labor for Our Revolution issued a joint statement of support - signed by Larry Hanley, President, Amalgamated Transit Union; Chris Shelton, President,Communications Workers of America; RoseAnn DeMoro, Executive Director, National Nurses United; and Peter Knowlton, General President, United Electrical Workers - and sent the statement to its list of union leaders and activists requesting additional grassroots support, resulting in more than 1,000 union members also "signing on" to the call supporting A Day Without Immigrants.